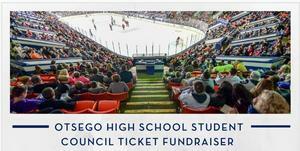 Take in a KWings hockey game and fight hunger for Otsego students! Not every student at OPS is guaranteed a meal on the weekends, but Backpack Buddies works to fight that hunger and you can help, too, by having fun! On November 9th, the KWings Hockey game will be a fundraiser for Backpack Buddies for all five schools! There is a special link to use to order your tickets and $5 from each ticket will benefit this program that provides students/families in need with food on the weekends throughout the school year. It costs about $150 to feed one child for an entire year, so this event could make a huge difference! And it'll be a fun night for you and you family! Here's the link to order tickets. The OHS student council is sponsoring this fundraiser; they will also run a Chuck the Puck contest and get the proceeds.